Photographers always eager to try different types of shooting skills. After go through the process of using natural light, they then goal for light which is controllable as well. 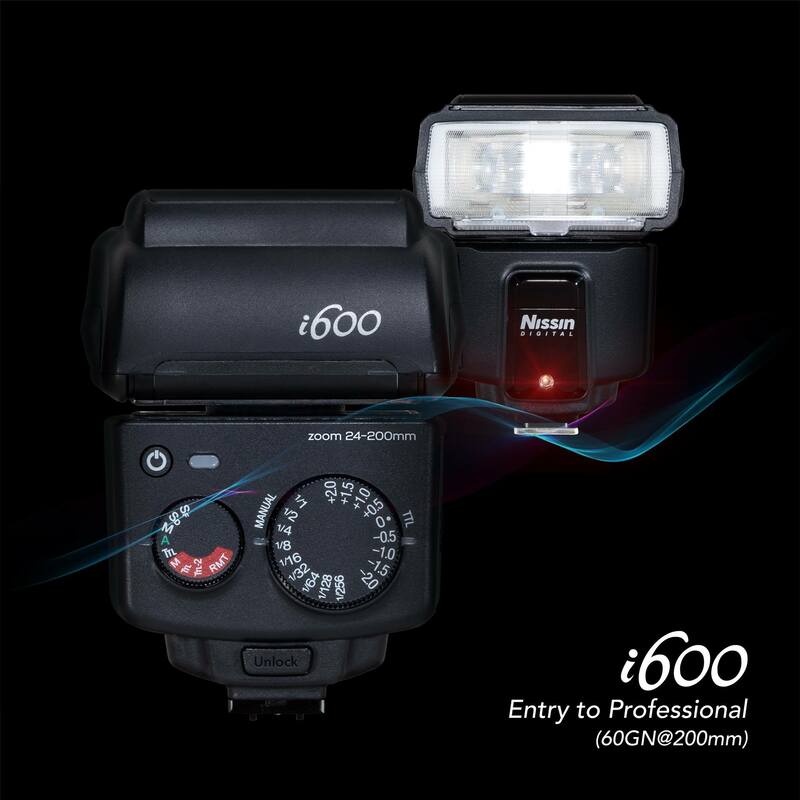 You can find the manual for the new Nissin i600 here. Taking pictures indoors or in low light conditions is a big challenge for the camera and photographer. Decisive is proper lighting control. Photographers who know when to use which light source to achieve a specific result are among the more advanced players in their profession. These are exactly the addresses for the new Nissin i600 high-performance flash with Guide Number 60 and HSS Sync. This can be controlled wirelessly and is available for cameras from Nikon, Canon, Sony, Fujifilm and MFT. The operation is simple and intuitive. The flash allows the illumination of focal lengths of 24 to 200 millimeters. Using the built-in reflector, the light angle can be extended to 16 millimeters. With flash units one has usually the choice: large, lush equipped and efficient. Or compact, with comparatively lean equipment and with rather low flash output. The new Nissin i600 is different: big in performance, small and lightweight in design. The compact design of the flash is the result of the consistent use of the latest electronics and particularly lightweight materials. That’s why the Nissin i600 is one of the lightest and smallest members of its guild in its performance class. Its sturdy plastic case contains lots of good ideas paired with state-of-the-art flash technology. The design of the i600 is based on the popular Nissin i60A. With a performance of 60 Guide Number at ISO 100 and 200mm reflector setting, as well as the many wireless capabilities, the i600 is versatile. The beam angle of the Nissin i600 can be adjusted either automatically or manually in the range of 24 to 200 millimeters to the angle of view of the lens used. 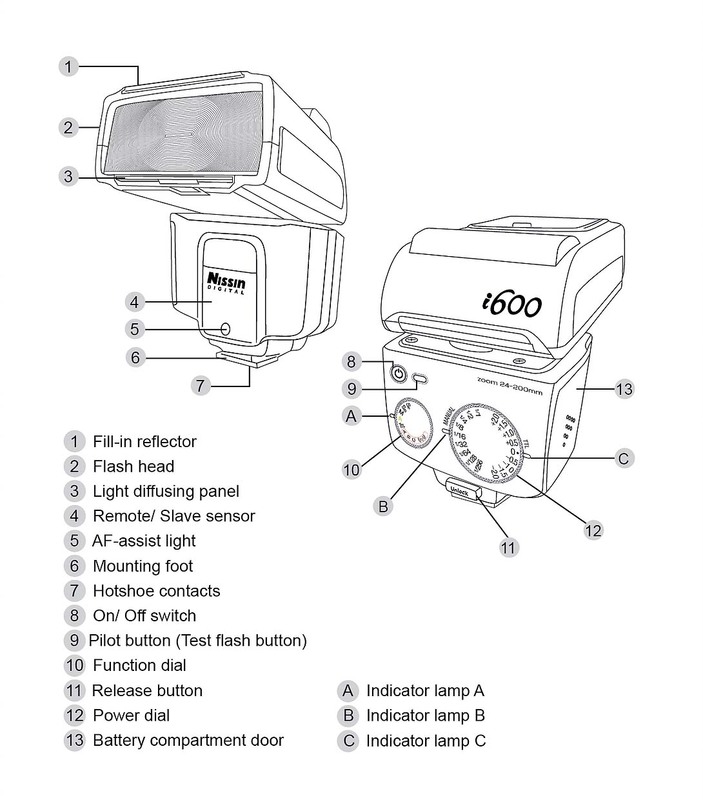 In addition, the flash is equipped with an integrated reflector, which extends the beam angle to 16 millimeters. The flash head can be rotated horizontally by 180 ° and vertically by 90 °, enabling indirect, soft flashing from many positions and angles. The left control wheel is responsible for setting the operating modes. The automatic position marked with a green “A” is the normal TTL mode for all standard flash tasks. For most cameras, this mode works with the camera modes Program Auto, Time, Shutter, and Manual. The flash output can be corrected by up to plus / minus two EV values. This happens in finely graded 1/2 steps. In this way, an individual illumination of different motives takes place, both in the studio and in the great outdoors. Another special feature of the compact powerhouse is the automatic high-speed synchronization. With this, shutter speeds of 1 / 8,000 seconds are achieved. HSS stands for “High Speed ​​Sync” and allows shutter speeds that are shorter than the flash sync speed of the camera during flash. This allows flash photography with open aperture (eg portrait with background blur) or sports photos with fast movements, even in bright ambient light. With dimensions of 112 x 73 x 98 millimeters, the Nissin i600 is ideal for compact cameras. Even the strength of the user is not set high standards, because the lightning weighs only 300 grams without the required batteries. A new set of AA batteries allows between 220 and 1500 flashes, depending on the set flash output. Unlike conventional compact flashes, where typically only two batteries are responsible for the power supply, come with the i600 four AA batteries used – best conditions for short charging times and high flash capacity. The frequency of battery replacement is thus reduced and the flash cycle times are extremely short 0.1 – 5.5 seconds. High output power – GN60 (Guide Number 60) with TTL optical mode: The i600 provides high output power of Guide Number 60 (at ISO 100, 200mm) in a compact design and various slave modes. Easy-to- Use Knobs : The Nissin i600 has two knobs: mode selection and EV adjustment. The selected settings are indicated by LED indicator lights. High Speed ​​Synchronization (HSS): The flash supports HSS up to a shutter speed of 1 / 8,000 second. Overheat Protection & Energy Saver: The flash shuts off after a hi-power series to protect against overheating, enters standby mode after 2 min of inactivity, and turns off after 60 minutes. 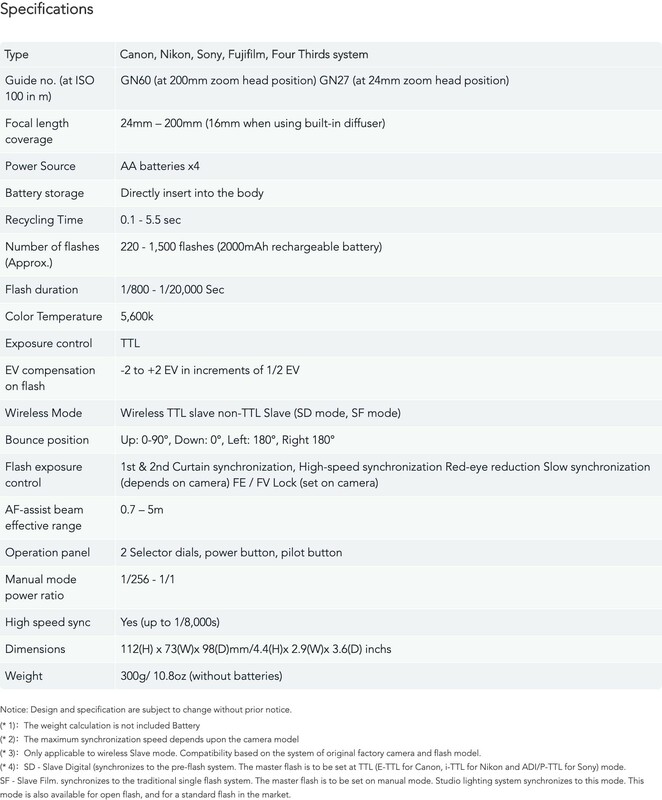 This entry was posted in Accessories, Fuji flashes and tagged Fuji Rumors, Fujifilm, Fujifilm Rumors, FujifilmRumors, Fujirumors, Nissin, Nissin i600. Bookmark the permalink. Trackbacks are closed, but you can post a comment.